Look, I’m not here to argue the fine points of cigar naming, but I’m also not above serving up an impromptu history lesson. Plus, this one makes perfect sense. A hogshead, besides just being served on a silver platter with an apple in its mouth, is a large wooden barrel that tobacco or alcohol was transported and stored in back when great great grand pappy was still around. This not only made lugging product from place to place easier, it also allowed whatever was inside to marry and age. And now that I’m done playing professor, welcome the newest member of the Torano family: Hogshead. Just as the name implies, expect a well-balanced handmade equipped with ample flavor. 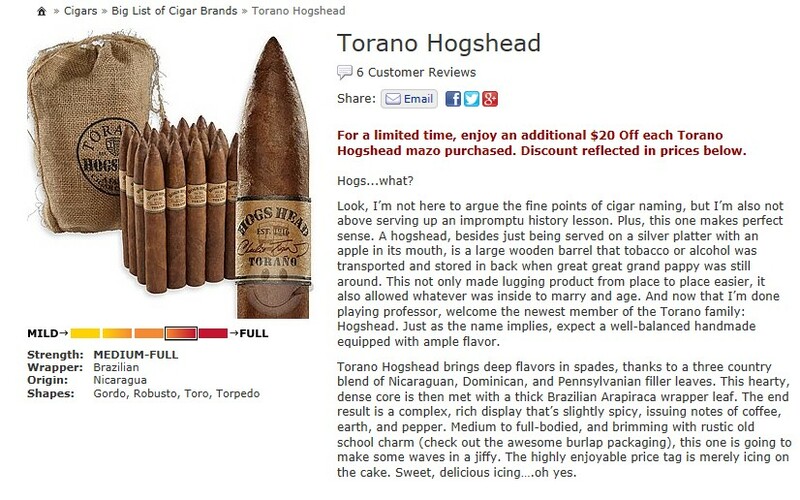 Torano Hogshead brings deep flavors in spades, thanks to a three country blend of Nicaraguan, Dominican, and Pennsylvanian filler leaves. This hearty, dense core is then met with a thick Brazilian Arapiraca wrapper leaf. The end result is a complex, rich display that’s slightly spicy, issuing notes of coffee, earth, and pepper. Medium to full-bodied, and brimming with rustic old school charm (check out the awesome burlap packaging), this one is going to make some waves in a jiffy. The highly enjoyable price tag is merely icing on the cake. Sweet, delicious icing….oh yes.